Everyone desires to have good health, abundant wealth, a prosperous business/career, a successful education and relief from all hurdles in life. For manifesting all this, one needs divine blessings in life, as it is the benevolence of the Divine that ensures the realization of our desires in our lives. Without divine blessings we are nothing but a leaf out in the winds. So, what invokes divine grace & blessings in the life of a person? There comes a time in life when everything seems to fall apart. Be it is a serious problem on the health front, some legal battle that an individual get entangled into or a financial crisis arising from a shake up in career/profession. Such tough times make the life of a person extremely difficult and all this takes a huge toll on the mental peace and family bliss of a person as whenever that person suffers, his/her near & dear ones tend to get affected as well. These problems arise when some highly negative karmic structure arises from the karmic baggage that a person carries along in life. While a person with his/her will & patience, manages to go through minor hiccups in life, but some problems are so severe in nature that they test all limits of a person's patience and break his/her morale all together. So what should a person do, in order to overcome such problems in life? The blessings of Lord Shiva, have the power to end all miseries of a person. While Lord Shiva is worshipped in many ways through different Pujas (worship rituals), one such Puja that if offered to Lord Shiva can end even the greatest miseries of a person is - "Maha Mrityunjaya Puja". Maha Mrityunjaya is one of many names of Lord Shiva and it means - The Great One who has conquered Death! One who pleases the Maha Mrityunjaya form of Lord Shiva, gets rid of even the gravest of problems. By performing Maha Mrityunjaya Puja, one gets the blessings of Lord Shiva that are bound to dispel all fears and problems from the life of an individual. Therefore, we urge you to book a Maha Mrityunjaya Puja for yourself and get a life that is peaceful, blissful and free from all severe troubles and miseries. Maha Mrityunjaya Puja destroys the presence of all negative energies surrounding a native by creating a protective aura around him/her. Maha Mrityunjaya Puja burns the excessive negative karmas from the karmic baggage of a native that are causing problems. Maha Mrityunjaya Puja protects a person from life threatening diseases and bestows sound health upon the person. Maha Mrityunjaya Puja stabilizes the turbulent career of a person and provides ample growth opportunities in the professional life. Maha Mrityunjaya Puja makes the person emerge victorious in legal battles. Maha Mrityunjaya Puja protects the person from all enemies (open as well as hidden). Maha Mrityunjaya Puja protects the property of a person from all disputes. Maha Mrityunjaya Puja brings out the person from financial miseries. Maha Mrityunjaya Puja infuses fortune into the life of the native, thereby bringing out the native from all unwarranted challenges of life. It also promotes chances of gainful foreign travels in one's life. Maha Mrityunjaya Puja protects the business of an individual from regulatory hurdles and removes all financial crunches by increasing the cash flow. Maha Mrityunjaya Puja removes financial problems from the professional domain of people in both job as well as business fields. Maha Mrityunjaya Puja, which will have 125,000 Jap (recitals) of the incredibly powerful "Maha Mrityunjaya Mantra" over a period of 7 days on your behalf by highly learned Brahmin Priests to bring forth the divine blessings of Lord Shiva/ Maha Mrityunjaya in your life. Arrangement of watching the Puja being performed under your name via a recording provided to you by us in the comfort of your home. Note: The Maha Mrityunjaya Puja is performed in strict accordance with all Vedic rules & rituals as prescribed in the Holy Scriptures. Why should I go for Maha Mrityunjaya Puja? 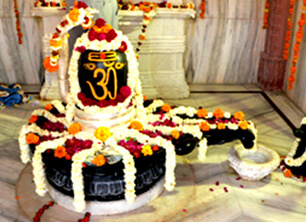 Maha Mrityunjaya is a form of Lord Shiva that protects a person from extreme problems and miseries in life. Therefore, His blessings are a must to lead a life that would become a manifestation of joy & happiness and free form all hurdles and obstacles. So, go for this life altering ritual! Who will perform the Maha Mrityunjaya Puja? We make sure that highly learned & experienced Brahmin Priests perform these spiritual rituals with utmost devotion. You need not to worry about anything as every single procedure as per the holy religious scriptures, is followed. Do I get to watch the Puja? Absolutely, you can watch the Mrityunjaya Puja being performed in your name via a recording provided to you by us. Is there any minimum age to go for Maha Mrityunjaya Puja? No. Anyone can go for this Maha Mrityunjaya Puja. Can I book the Maha Mrityunjaya Puja for someone else in my family? Absolutely! What better gift can you give to your near and dear ones, than making sure that they get the powerful blessings of Lord Maha Mrityunjaya!